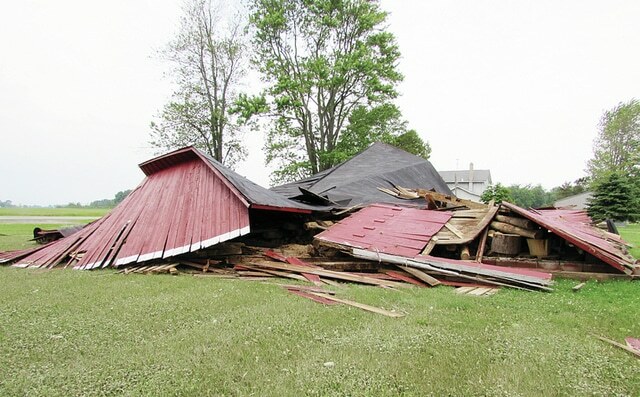 The strong winds of a violent thunderstorm last week blew over this barn on US20A outside of Wauseon. Blame last week’s lashing rain and lightning show on a dogged high pressure system blanketing most of the nation and acting as a catalyst for heavenly fireworks in Fulton County. And, according to a regional meteorologist, the show may not be over. Nick Greenawalp, a spokesperson for the northern Indiana office of the National Weather Service, said the recent deluges and pyrotechnics have been caused by a persistent high pressure weather pattern originating off the southwest coast near Florida and Georgia. The system has allowed gulf air to stream across the country including the Midwest. While high pressure systems are usually associated with calm, dry conditions, the introduction of gulf moisture allows for instability which can fuel thunderstorms, Greenawalp said. If a cold front moves through “the atmosphere is really primed for a thunderstorm,” he said. It can be triggered by as little as a breeze off of a lake, he added. “We’re in that stagnant area, a thunderstorm environment. Conditions have been right for severe weather as well,” Greenawalp said. He said northwest Ohio is a “ring of fire” pattern in which the area is on the edge of a high pressure system that includes warm air and moisture. A heavy storm last week displayed a lot of lightning strikes because of its intensity, Greenawalp said. A severe thunderstorm warning was issued on Wednesday. The Fulton County Sheriff’s Office reported a funnel cloud at US 20A between Archbold and Wauseon. It didn’t not touch the ground, but the warning sirens were sounded in the county.